Professional SF writer. Amateur sport watcher. Rather than reviewing the round just passed, I thought this week I’d use most of this space to preview the finals instead. First off, if you consider yourself a fan of the Carlton football club in any capacity, but you’re not following your women’s team, you’re setting yourself up for some very embarrassing moments in your future. This round of football was brought to you by foot speed. You know, that thing that you think your team has plenty of until the athleticism of the competition hits a new level and it turns out you’ve got none. 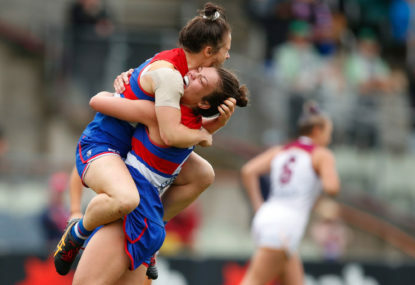 Mark this round down in your diaries, for Round 3 of the 2019 AFLW season was probably the best and certainly the most consequential played in women’s football so far. 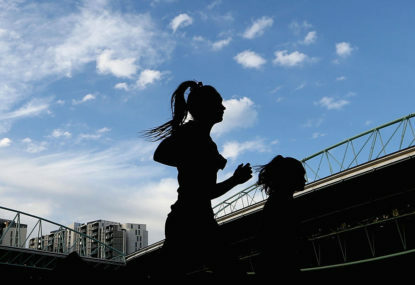 After going to the Collingwood versus Melbourne game on Saturday, I was thinking of dedicating this report to the question of why so many women’s football games are so ugly. My rule of thumb is that AFLW clubs must currently improve by twenty percent per year just to avoid going backward. 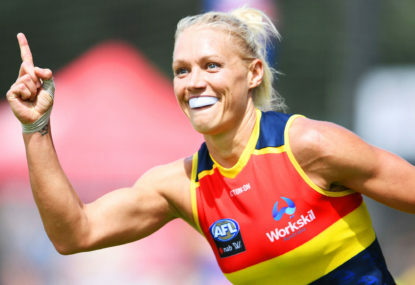 If Erin Phillips is fully fit in 2019, that will be most of that twenty percent right there. But that single improvement, if it happens, will be just the beginning. Sport, like life, is rarely fair. 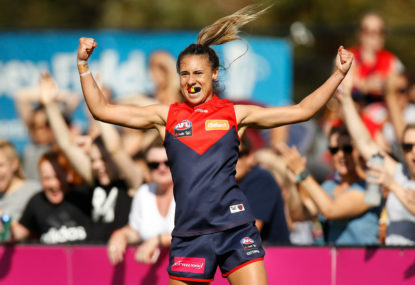 The Dees got smashed in the offseason, not just with the players they lost to expansion, but with the announcement from Daisy Pearce that she’s pregnant with twins. But despite getting smashed, they still look awfully good on paper. 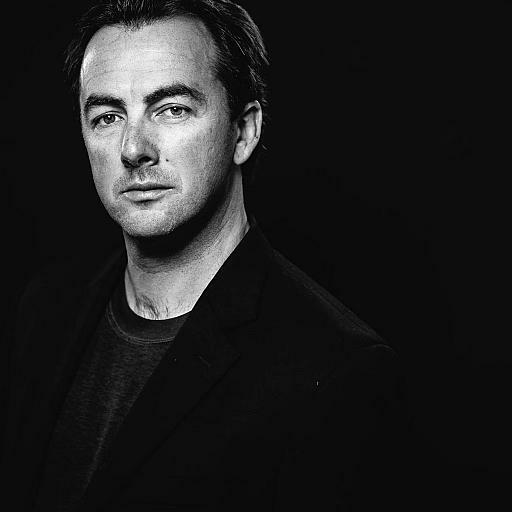 In building their team for the 2019 season, North Melbourne decided to eschew the draft while focusing on established senior players instead. In the AFLW’s early years, this is almost always a mistake. For a moment there in the draft, I looked at Geelong’s haul of young talent and almost reconsidered my guess that Geelong will struggle this year. 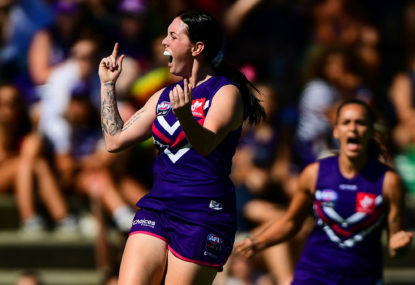 In the short history of the AFLW, there are few hard luck stories as hard and unlucky as that of the Fremantle Dockers. 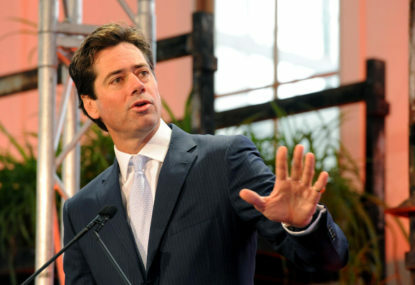 Gillon McLachlan has a communication problem. This seems obvious after news emerged that the 2019 AFLW season is likely going to be the same length as 2018 — but with one week of regular season removed to make way for a qualifying final. 1) I don’t expect the average standard to drop, I expect it to increase. But you can find an average halfway between two extremes, and as such I expect the overall standard to become a lot more uneven. Fremantle will probably drop back as West Coast takes many of their players, ditto Brisbane who were already struggling, and neither of the two Victorian expansion teams will be able to match North’s big recruiting successes this year (I think). Plus GWS are super-slow, need new talent but find it hard to get because of the AFLW’s state-by-state nature… so that’s 7 teams that should be moderately crap next year. 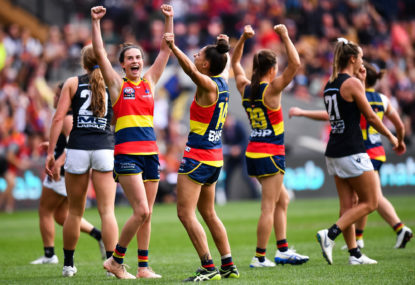 On the other end, Adelaide might hardly miss a beat, so there could be a lot of nasty blowouts against the Crows, like we saw in the Semi against Geelong, and against any of the other Vic teams that manage to keep their list together. 2) the knee thing is way beyond my knowledge, I’m open to anything that will work, but only the physio experts can guess what that might be. I’d like to see the full stats, but ACL injuries certainly got better this year than last, and if it weren’t for the Grand Final we might be talking about how much it improved this year. Also, I’m looking at the injury rate in the AFLM right now and I’m not sure that overall the women are any worse for season-ending injuries. Worse for ACLs, certainly, but take everything else together, they might even be better — aside from that practise game and the GF, Adelaide had very few this year, and Carlton almost none, for example. 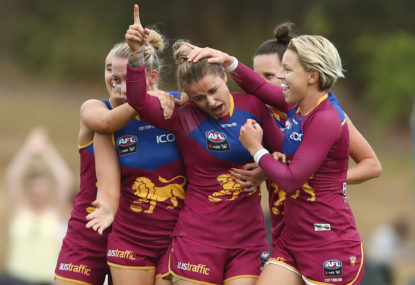 3) For me the big story of this year is that the AFLW’s biggest problem (slow, ugly games) appears to be fixing itself. Previously the AFL bigwigs told the coaches they had to play more exciting football or the fans wouldn’t turn up, and the coaches said, rightly enough, that their job wasn’t to play exciting football, but to win games. But this year, the least exciting coaches all lost nearly all the time, and the most exciting coaches won heaps, and mostly only lost against each other. 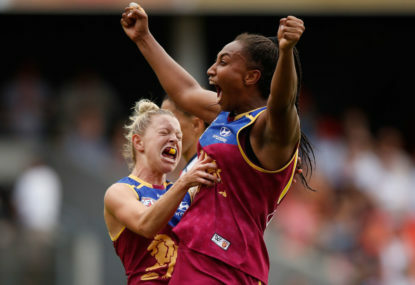 Some of the rule changes have helped, but that development gives me huge confidence that the AFLW will be fine from this point on, because the need to be exciting has aligned with the need to win. So my hope is that few if any major rule changes will be necessary from this point on. SA women’s footy is still a few years behind, so for example, there’s only two SA girls in the AFLW Academy this year, last time I checked. But thus far though the pickings have been slim, they’ve been elite (Jones, Scheer, Marinoff, Allen and then Ponter, Hewitt from the NT). I’d reckon the big surge of SA youngsters will currently be about 14 or 15 years of age, so a few years yet. And at that point the AFLW might have to force Port to start a team, or the Crows’ advantage over everyone else will get completely nuts. I agree, those changes in the game make it far more interesting to analyse than the men’s game. The men still have those obvious advantages in playing standard and spectacle, but talking about that game can never be as interesting as a comp where the playing style and standard radically changes every season. And yeah, I’m planning to do a little in the off season. The U18 national champs are always fun — already in the NAB League Girls comp there’s players popping up to get BoG that were never mentioned before. The women’s comp is producing new stars at an accelerating rate. I’ve said Jones is a gun since I saw her at the U18s a few years back. It’s even possible she turns out to be the most accomplished player currently on that team (unfair on Erin and Chelsea given how much footy they’ve missed, but still). It will certainly be interesting to see if anyone other than West Coast comes sniffing around the Crows lineup. There’s no way Anne Hatchard is being paid top dollar right now, and I don’t know how many players Adelaide are allowed to fit into that top tier. But then, asking her to move to Victoria will be expensive in itself, and could easily be asking her to give up a second premiership. The Blues could still get flogged — they’ve been inconsistent all season, it depends which Carlton shows up. My point is simply that their best level is hypothetically very close to the Crows. The Crows started the season playing at %70 of their best footy (save that awful Round 1 goal kicking) and are now %90 or more. Carlton started at maybe %40 of their best, and have been steadily building, with hiccups. Against Freo, they hit maybe %80 percent — the Crows would still probably have got them, but not by much. But if the Blues hit %90 or more on Sunday, it’s going to be close. The best five teams were North, Freo, Melbourne, Carlton and Adelaide. North, Melbourne and Adelaide were always going to be good, so the coaches can’t get as much credit. Freo and Carlton were awful last year, and coaches win awards for turning teams around, getting them off the bottom of the ladder to the top. So it has to be either Harford or Cooper, and since Carlton flogged Freo in the Semi (effectively making THEM the second best team whatever the ladder says), it goes to Harford. If the Semi had gone the other way, probably it’d go to Cooper… and probably just as deserved, given the injuries the Dockers had in that match. But it goes how it goes. 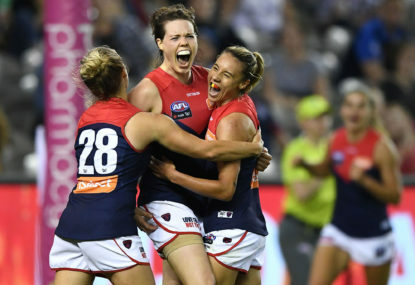 No idea, they used to have all the stats here https://www.afl.com.au/womens/matches/stats but the players stats for the whole season have vanished. My guess is all the resources got diverted once the men’s season started. And yes, Harf would get my vote too, with Cooper second. At the very least the AFL could consider treating these people the same way they treat fans who racially abuse players on the field. I’d guess some percentage of the commenters will be AFL club members — find out who they are and ban them. The AFL is a private entity, it has the right to enforce its own moral standards and refuse entry or membership to anyone who violates its standards. Same thing here. Agree about the coaching. It seemed to me they were playing more aggressively early in the season, but after Morrison went down they focused on defence. You could argue it did its job and got them to the finals, but it’s no way to develop a team full of young players, given the true task of the coach should be to develop them for a potential premiership run in a couple of years. The kids won’t learn to play finals-winning football doing what they’ve been doing this season. Imagine Conti alongside Prespakis and Dalton next year, once Dalton learns to kick straight. They’d run riot. They’ve got no other team in SA draining their talent pool, either. Could be the top team for a long time. I watched the first half of the Eagles against Geelong in JLT… it’s cool to see the boys again, and especially to see the up and coming kids, but after two quarters I was dozing off. 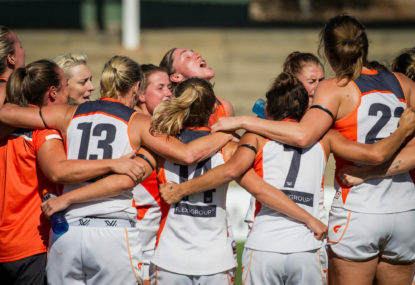 Whatever the AFLW lacks, one thing it’s got is intensity. No one’s going to injure themselves trying to win a JLT game, and the fans would be upset if they tried. And given most of those first quarter misses were Vescio and Harris, it’s hard find any fault with the way they’re playing, just with the execution. The Blues have a whole bunch of players who are super fast and fun, but need to polish their skills, so it must be a bit frustrating for Harford when his best, most experienced forwards start fluffing kicks as well. But if they get their act together in time for finals, they could cause a few shocks. Ebony Antonio. But these days the women are all focusing on percentages and professionalism. That’s great, but it means I doubt we’ll see many speckies for a while. Except from someone like Tayla who’s slightly nuts, in the best possible way. My opinions on this are always evolving, I’m probably coming around to the idea of more anti-congestion rules than I was. But my point has always been that the main thing causing congestion in the women’s game has been flooding, defensive coaching strategies. And the point of this article is that those are changing without needing massive AFL interference. Sorry Downsey. Grew up in Perth, whatcha gonna do? It’s the first time I’ve ever gone after anyone. I don’t like doing it, no one in this league is getting paid much, and going after people making very little is different to going after AFL coaches making big bucks. What did it for me was watching Collingwood’s kids on the weekend, and recalling them from the U18 champs when they were looking so confident and talented. It’s just so sad to see them having an obviously bad time and not enjoying their footy. 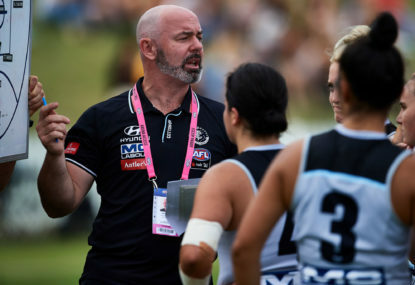 The Cats girls might not be winning much either, but at least they know they’re playing good footy and learning things that will make them better next year. Interesting. I guess it would give midfielders someone to kick it to, encouraging them to go forward, and would thus create more reward for teams using the corridor. And you don’t need to make a similar rule for backs, because of course if the forwards are in the 50, they won’t be left undefended. I have no fixed opinions on any of this, it might be worth a look. I’m very reluctant to start enforcing those kinds of rules, and I suspect they could be counter productive. I like some of the anti-congestion rules at the moment, particularly last-touch out of bounds and moving the throw-in ten meters off the boundary line (which might not seem like anti-congestion rules, but that’s their effect). But I’m also starting to doubt if even playing 16 a side has actually helped combat congestion or made it worse. When the ball gets locked into a contest, players are often reluctant to clear it forward because they’ve no team mates forward of the ball. The same with lateral movement, which I think is the real key to opening up the game — often it’s hard for players to move sideways because there’s simply not enough players on the ground to position defensively, on the ball, and laterally at the same time. Teams have fewer options, and so just kick it up the wing to the same old conservative contest again, for yet another pile-up. Like you say, a lot comes down to the coaches. I reckon if Craig Starcevich had a full 18 players, he’d position them all defensively to try and lock the game down. If Trent Cooper or Scott Gowans had 18, they’d have more players wide and long to try and spread the ball and run through the corridor — those guys coach fine football right now without needing any more rules. Ultimately the only solution is that the offensively minded coaches start consistently beating the defensively minded coaches, and convince everyone that that’s how the game needs to be played to win championships. 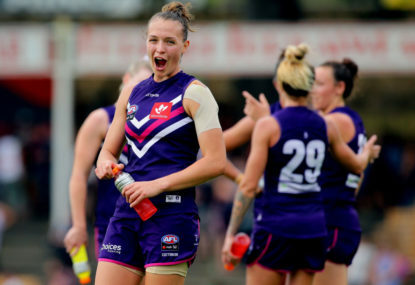 In which case, every neutral AFLW fan should be cheering for Freo and North this season, and probably Carlton too, since Harford seems that way inclined as well. I’d guess it’s probably common knowledge which Freo players would rather be Eagles, in WA at least. But yeah, I’m sure that’s part of Cowan’s job at West Coast, to identify those players for next year. Interesting to see how many the AFL will let leave. The happiest team right now is Fremantle. If they stank this year too, the Eagles might have cleaned them out next year. They still might, but a lot more of Freo’s stars will be thinking about staying if they make a good run in the finals. Against the Dogs on Friday will be interesting. The Roos have more midfield depth, they can afford to have a midfielder or two having a bad game, but the Dogs can’t. Maybe the Roos should tag Conti — Blackburn’s used to it, but Conti’s not. If the Roos keep her below 10 possessions, they win easy. It’s a blow to my confidence too, but it’s too early to give up. I was assuming they’d have Bri Davey and Nic Stevens at halfback, where they could help out the midfield, but not only is Davey wasted in the forward line, Stevens seemed to be playing deeper in defence, so the midfield’s really on its own. Also, Abbie McKay wasn’t playing — sure she’s inexperienced, but the Geelong kids were inexperienced too and look what they did. I was hoping Carlton was recruiting young midfielders because they realised their present midfielders weren’t up to it. 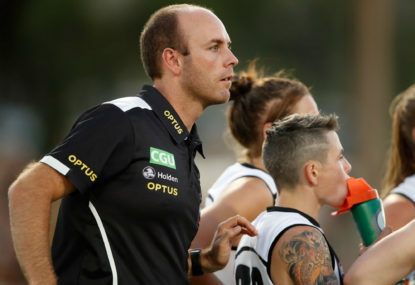 But instead their round one lineup gave preference to the same more experienced midfielders who did badly last season, with exactly the same result — Shae Audley had 6 possessions, the Hoskings twins had single figures each, and while Jess Edwards did a big job on Emma Kearney, she only had 9 possessions also. But Katie Loynes was terrific, and Prespakis as always (think she was getting tagged for some of it), and Mullane can play better — put Abbie McKay in so you’ve actually got a critical mass of people who can use the ball, put Stevens and Davey on halfback where they can run and linkup with the mids, and it starts to look alright again. Will it happen? Most coaches are very bad at changing direction mid-season, so probably not. It’ll be interesting to see which teams start assembling enough long kicks across halfback to switch play more easily. If you had a theoretical all-star team with, say Bri Davey, Chelsea Randall and McKenzie Dowrick (in a few years) across halfback, they’d get the ball to the far wing nearly as efficiently as the men do. At the moment, you’d probably fall short and get intercepted in front of goals, so no one does it. But it’ll change the women’s game when teams can do it regularly, and kicking distance is the big reason why.